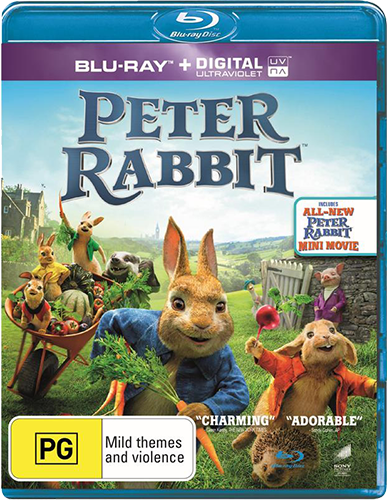 Win: Peter Rabbit - Hop in and grab this great prize for the family! | SWITCH. HOP IN AND GRAB THIS GREAT PRIZE FOR THE FAMILY! One of Beatrix Potter’s most adored child’s tales comes to life with the rebellious Peter Rabbit, voiced by James Corden ('Into the Woods', 'Trolls'), and friends as they fight for ownership of the McGregor vegetable garden. This heartwarming tale is voiced by an all-star cast including Margot Robbie ('I, Tonya', 'Suicide Squad') as Flopsy, Elizabeth Debicki ('The Great Gatsby', 'Guardians of the Galaxy: Vol. 2') as Mopsy, and Daisy Ridley ('Star Wars: The Last Jedi') as Cotton-tail with Rose Byrne ('Bridesmaids', 'Spy') as Bea and Domhnall Gleeson ('Star Wars: The Last Jedi', 'Ex Machina') as Mr McGregor. The 'Peter Rabbit' competition has now closed. Winners will be announced shortly. Competition opens at 5pm AEST on Sunday 24th June 2018 and closes at 11:59pm AEST on Sunday 1st July 2018. Five winners will be chosen at random on Monday 2nd July 2018. To successfully win, entrants must fulfil the above entry conditions before the time the competition closes. Current members/followers are eligible to enter the competition. Only one entry per person. Only one winner per household. To be a valid winner, the entrant must not have won a prize from SWITCH within the last 28 days. Each winner will receive one Blu-ray copy of 'Peter Rabbit'. By entering, you agree to receive occasional emails from SWITCH in the future. If you decide to unsubscribe from these updates, any further entries will not be applicable. Only Australian residents are eligible to enter. 'Peter Rabbit' is available on 4K Ultra HD, Blu-ray, Digital and DVD on Wednesday the 27th June 2018 from Universal Sony.